Karen is a dynamic, Canadian born NYC based dancer and teacher. She trained professionally with the Royal Winnipeg Ballet Professional Division and performed at Madison Square Garden with PHISH; the World Premiere of the Canadian Opera Companyʼs Das Rheingold (Wagner Ring Cycle); the Canada Winter Games; for HRH Queen Elizabeth II during the Golden Jubliee Tour and other companies around the world. She is certified in Usui Reiki and is U.S. Member of the International Dance Council CID, recognized by UNESCO. Karen was introduced to the GYROTONIC EXPANSION SYSTEM® while recovering from a neck injury. 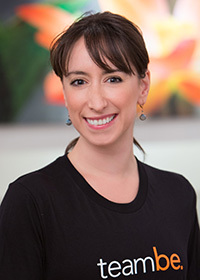 One of the things Karen loves most about the GYROTONIC® Method is how well it aligns with the body’s natural intelligence and connection to flow. Karen is excited to be a member of the BE team and looks forward to facilitating more freedom of movement and ease for BE clients.